This year, we’ve taken a slightly different approach to the newest version of Vectorworks software. Don’t worry – as in previous years, we’ve added many exciting new features and improved existing capabilities to make your workflow easier; this brochure will be your guide to what’s new in Vectorworks 2013. Instead of just giving you a rundown of the new features, we’d also like to share with you some of our thinking behind this release. To put it simply, the world of design is changing. Building Information Modeling (BIM) is revolutionizing the AEC industry. Cloud technology is adding freedom and convenience to the design process. And the competitive economy is increasing the need to create stunning presentations to win business. Whether you’re an architect implementing a BIM workflow, a landscape professional striving for sustainable sites, or an entertainment designer pushing the limits of innovation in lighting, we know your process as a designer is evolving. As your process evolves, the tools you use to realize your creative visions need to evolve, as well. We understand this, and we’ve worked throughout the past year to adapt the Vectorworks family of design solutions to your needs. As you flip through this brochure and try out the new version of the program, you’ll discover more than 80 improvements along with new commands and tools, as well as new forms of collaboration to support your design practice. 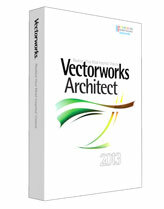 Streamline your workflows…improve your efficiency…evolve with Vectorworks 2013. Thinking of upgrading from Vectorworks 2009, 2010, or 2011? Not sure what is in it for you? Lost track of how far we’ve evolved? Vectorworks Architect offers all the tools and technology that commercial and residential designers and builders need in one powerful, cost-effective program. It is easier to learn and use than most other architectural software applications yet it is capable of creating your most complex designs, from pre-design through construction. A brand new offering, Vectorworks Designer combines all the exclusive technology found in Vectorworks Architect, Vectorworks Landmark, Vectorworks Spotlight into one easy-to-use program. Providing advanced production, presentation and collaboration features, it is the ideal solution for multi-disciplinary firms and designers who do it all. 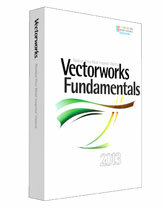 Vectorworks Fundamentals is a straightforward, yet professional CAD program. In addition to precision drafting, you will find powerful tools for 3D modelling that can help you create, present and even manufacture your designs. Built-in database and worksheet capabilities help track costs and materials. A host of import/export features makes sharing files easy. You also get free object libraries, as well as a built-in scripting environment that can automate routine tasks. No other CAD software offers so much for so little. Landscape design software doesn’t have to be too expensive or too difficult to use. A short learning curve, advanced 2D and 3D site design capabilities, automatic schedules and reports, a vast plant database, a suite of architectural building tools, free landscape and site object libraries, plus DXF/DWG and GIS compatibility will help you become more productive, more competitive and more profitable. Renderworks seamlessly integrates into all Vectorworks solutions to provide you with sophisticated photorealistic and hand-rendered effects. Whatever your objective—realistic or artistic, you can create stunning presentation materials to help you sell your ideas. The standard in entertainment and lighting-design software, Vectorworks Spotlight merges sophisticated 2D drafting and powerful 3D modelling with advanced lighting-design, visualisation and production tools. It is easy to draft light plots, create stunning set designs, automate paperwork and visualise design concepts in 3D. Spotlight is the all-in-one, cost effective, easy-to-learn, easy-to-use application.